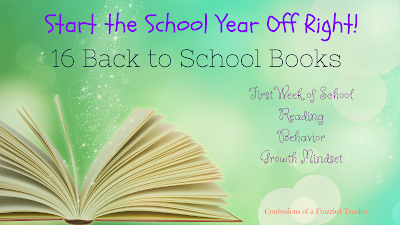 Confessions of a Frazzled Teacher: 16 Back to School Books That Should be on Your Must Read List! 16 Back to School Books That Should be on Your Must Read List! Are you ready to rock back to school? I know I am! 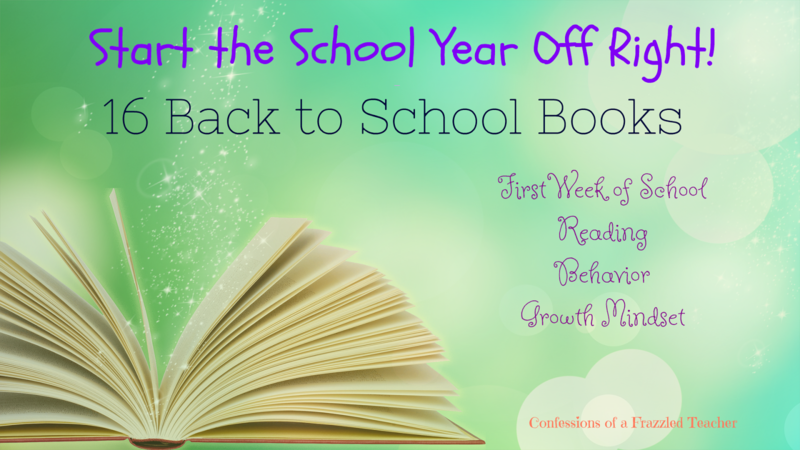 To help you get fired up and help you with my favorite time of day - read aloud time - I have compiled a list of some amazing back to school reads. * Disclaimer: Please note that this post contains some affiliate links that, if you click on the product, I will receive compensation at no cost to you. 1. First Day Jitters - This is my go to book for the first day of school. It makes a great informal way of evaluating students on their ability to draw conclusions (aka higher level thinking skills). The longer it takes my students to 'get' the end of the story, the more work I have cut out for me! Bonus - There are other books in this series that I love! 2. Third Grade Angels - This chapter is a cute one to start the year off, assuming you teach third grade (like me). There is a sequel for forth grade - Fourth Grade Rats - but I am not a fan. 3. If You Take a Mouse to School - Many students are familiar with this series. This helps them to feel comfortable in a new environment. 4. The Kissing Hand - Help ease the fears students have being away from home with this book. It's perfect for younger students. Bonus - This story is free to watch on Storyline Online! 5. Goldie Socks and the Three Libearians - This is an adorable version of Goldilocks. This book is brilliant at teaching students to find a book that is just right for them (like using the 5 Finger Rule). 6. Miss Smith's Incredible Storybook - This is another series that I love! During the beginning of the school year, I spend much of my time finding books that will show students how great is to read. This one definitely does that! 7. Miss Malarkey Leaves No Reader Behind - This is another series that encourages students that there is a book out there for them. I definitely get compared to Miss Malarkey, and I am fine with that! 9. My Mouth is a Volcano - Teach students not to interrupt; it's all about self-control. 10. A Bad Case of Stripes - This is a fun one to show students how they need to be true to themselves/not worry about what others think! Bonus - This story is free to watch on Storyline Online! 11. Enemy Pie - Show students that they can get along with anyone, even their enemies! Bonus - This story is free to watch on Storyline Online! 12. Wonder - This is a genius chapter book. With the movie coming out, it's a great read. It will make students think about how they treat those that are different from them. 13. The Dot - Students need to know they are capable of anything!This book shows students that they need to believe in themselves. 14. Ish - Confidence is the key. I love how a book can help instill this in students! 15. Everyone Makes Mistakes! It's as simple as that! Once students learn that they will make mistakes but can learn from them, they are more willing to try new things! 16. The Best in Me - I saved my favorite for last! This book is written by my former student Reilly Jackson. Reilly comes back every year and mentors my students! I am so proud of him! What book(s) are on your Back to School Must Read List? Hello! I just saw on the Blog Queens' blog that you got a new blog design! It looks great - I love how your student wrote one of your favorite books and comes to mentor your students. What an amazing opportunity! Thanks for your kind words! I am so lucky to have Reilly come back and mentor my students! It is so encouraging for them to see someone so successful!